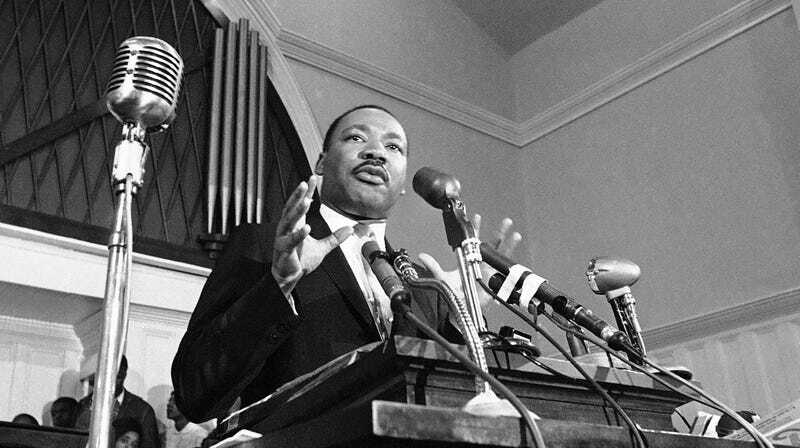 More than 50 years have passed since the assassination of Dr. Martin Luther King Jr. Since then, we’ve come a long way as a nation—just look at our new Congress—but we’ve still got a long way to go. Poverty rates among black and Latinx people in the U.S. are more than double those of their white peers. The most disenfranchised communities still lack opportunities to thrive, rather than merely survive. Climate change, or rather stopping it, has finally created an opening to elevate communities of color and low-income people financially. It’s called the Green New Deal. This proposal, which is gaining steam on a national level, aims to shift the country off dirty fossil fuels and toward an equitable clean energy economy. The Green New Deal’s proponents aspire to create jobs for everyone, building wealth for communities that have historically been left behind. King didn’t live long enough to see the issue of climate change rise to its current level of urgency. But his son Martin Luther King III, who continues his dad’s advocacy work, has called the environmental battle a “fight for equal rights.” We can only imagine what his father would say of the countless families in the South, Puerto Rico, and California who are plagued by hurricanes and wildfires made worse by global warming. We still have not, but we’re working on it. And we have King, in part, to thank for the modern push to develop environmental policy that’s equitable. Much of his discourse around black unemployment and government-sponsored job creation helped set the stage for conversations about a Green New Deal. In fact, the so-called Green New Deal may not even go far enough by King’s standards. The civil rights leader championed the idea of a guaranteed annual income, investment in half a million low-income housing units a year to eliminate slums, and $30 billion a year funding to eradicate poverty. This was all in the Economic Bill of Rights he proposed in 1968 during his work with the Poor People’s Campaign, a yearlong effort to raise awareness and solutions for poor people of all races so that they could live better lives. The Poor People’s Campaign was revived on its 50th anniversary in December 2017. Today, its pillars include not just poverty, systemic racism, and militarism, but ecological devastation, said campaign co-chair Reverend Liz Theoharis. This campaign works to honor King’s life by continuing his work, which is nowhere near over. King believed it was wrong for people to live in poverty, especially in a country as wealthy as the U.S. Plain and simple. And his values around equality and justice are exactly the type that proponents of a Green New Deal want to center. It’s a new way of approaching environmentalism, explained Clayborne Carson, a historian of the civil rights figure who founded Stanford University’s Martin Luther King Jr. Research and Education Institute. Protesters in the March for Jobs, Peace, and Freedom march up Constitution Avenue in Washington on August 27, 1983. Pittsburgh Is Going Green, But Who Is Getting Left Behind? This sort of wealthy white environmentalism is what inspired the creation of a more justice-centric climate action plan in the first place. While the term Green New Deal was first used by New York Times columnist Thomas Friedman in 2007, economist Robert Pollin, co-director of the Political Economy Research Institute, began researching the impacts and potential of a green economy some years earlier. He was skeptical that investing in renewables would be detrimental to the economy and the labor sector, as was the dominant narrative then. In his research, he discovered that a shift off fossil fuels held major potential, including millions of new jobs. And those jobs would be for people with all levels of education. We’d need truck drivers, construction workers, manufacturers, assistants, secretaries, scientists and engineers. Whether the Green New Deal succeeds in achieving equity for people of color really depends on the details written into such a proposal, but that’s what it’s supposed to do, in theory. “Because the Green New Deal is going to have to be subsidized by government, government will have a lot of leverage in setting hiring standards under the Green New Deal,” Pollin told Earther. People like Rep. Alexandria Ocasio-Cortez are sure to mention justice and equity when discussing the Green Deal. The Sunrise Movement, a youth-led climate justice group, really brought the potential for a Green New Deal back into the public consciousness when they infiltrated Democratic Leader Nancy Pelosi’s office last year. They talk about the deal in strictly equitable terms. The creation of a deal should include the leadership of historically marginalized groups, she went on. This includes indigenous people, tribal nations, low-income communities, and communities of color. Instead of government investments going toward multinational corporations, this climate justice group wants a Green New Deal that funnels money into small businesses and public firms. This helps communities build wealth rather than exacerbating our gross income inequality. King’s work with the Poor People’s Campaign and his call to transform our economy are felt today in the Green New Deal. His legacy lives on in this progressive proposal that could finally create a just world where power plants no longer spew toxins into the air and families no longer have to struggle to keep their lights on.